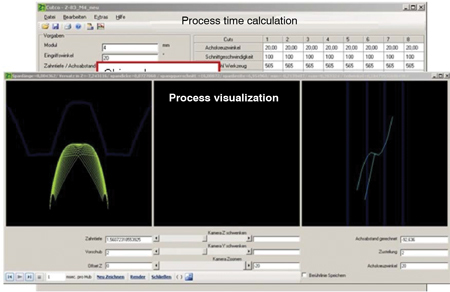 The optimization of each process can be achieved by the integration of different processes. This shows a high potential for the reduction of the lead time, as well as an increased level of workpiece quality. 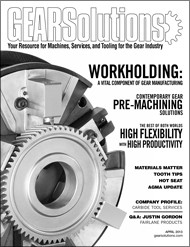 Depending on annual production volumes, batch sizes, and workpiece geometry, several gear manufacturing technologies are used for industrial gear production. The one most applied is the hobbing process, followed by broaching, shaping, sintering, and rolling processes. 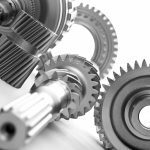 Up-and-coming gear manufacturing processes are power skiving, forging, precision blanking, and cold forging . 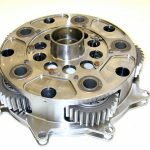 Due to improvements in the numerical control of direct drive technology, the power skiving process has become a competitive gear manufacturing process in comparison to shaping, blanking, and broaching. The potential of the reinvented power skiving process will be explained by production volume analyses, achievable gear quality, and gear geometry modifications. The economic and environment-friendly aspect of the power skiving process will also be explained. Due to increased flexibility requests on industrial serial production today, batch sizes are decreasing , while the part complexity and requested workpiece quality is increasing. For meeting both requests, the process chain has to be analyzed for shortening setup times and reduced floor-to-floor times. 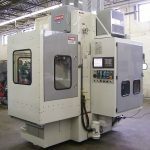 One possibility in gear hobbing was the integration of chamfering and deburring work in the hobbing process. Such processes have been realized for horizontal and vertical workpiece orientations, as those shown in Figure 1 and Figure 2. 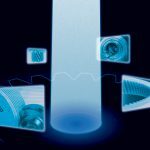 The benefits of the integration of chamfering processes into the hobbing process are proven by reduced chamfer tool investments and higher accuracy of the hobbed lead. 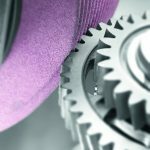 This is the basis for reduced stock removal rates on the hard finishing processes, such as honing or threaded wheel grinding. 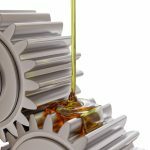 A second possibility for universal gear manufacturing is the generation of internal or external gears by power skiving. 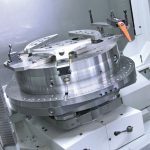 In this manufacturing technology  , a tool is placed in a cross axis angle relative to the workpiece. Similar to the shaving process, chip building is initiated by the relative velocity between tool and workpiece (Figure 3). Compared to the hobbing process, the tool life is reduced and chip removal rate remains at the same level. However, a larger amount of chips are generated. 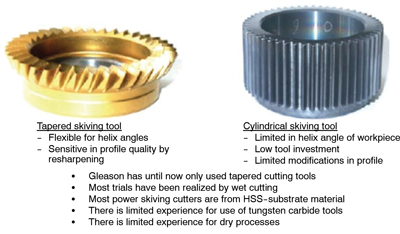 In general, all hobbing applications can be realized by power skiving, but a higher tool cost will be initiated. Regarding the shaping process, a tremendous reduction in manufacturing time will be initiated by the power skiving process (see Table 1, Table 2, and Figure 4). This will increase productivity, but not all shaping applications will become substituted by that manufacturing technology. For power skiving, tools from HSS and tungsten carbide can be used. 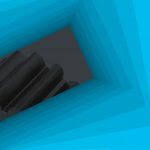 In regard to the substrate costs and grinding costs, the PM-HSS substrate material is the preferred solution. Only in the case of small pitch applications (m < 1 mm) and very abrasive workpiece materials (such as cast iron) will the tungsten carbide material be beneficial in comparison to the HSS solution. The tapered concept is from higher flexibility and reduced machine axis. 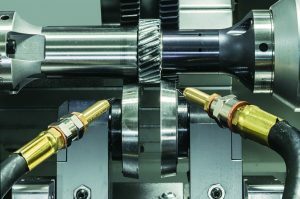 Instead, the use of cylindrical tools is more sensitive during the setup work, and an additional NC axis for the lateral offset is necessary. The tool design for a given application has to show constant load and good clearance angle conditions. 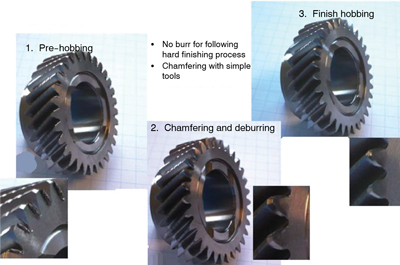 For most internal gear applications, the number of teeth will be different based on the existing tool layout of shaping application (Figure 5 and Figure 6). 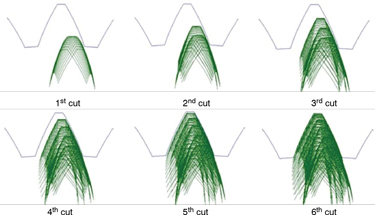 The chip formation from the different cuts shows on the same level of tool related load to a different structure of the chips (Figure 7). The chip contact on the rake angle of the tool is very close to the cutting edge. Due to the thermal impact, the most used HSS tools are those from highly abrasive characters. A craterization was not identified. 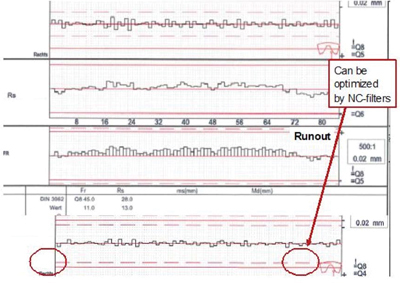 Due to chip deformation during the power skiving process, the shown U–form chips are on a high level of collision by themselves. This effect increases the cutting forces, and the chip flow area is very close to the cutting edge. By generating only L-form or I-form chips, the level of chip flow interference is reduced. The chip flow area on the rake face is a larger distance from the cutting edge, and due to that effect, the cutting forces decrease. A secondary effect is an improved tool life. For tool life optimization, a modified in-feed strategy is possible (Figure 8 and Figure 9). 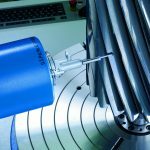 Based on an oscillating motion between the leading and trailing flank per cut, the wear development on the cutting tool can be directed in a well-balanced way. The power skiving of large workpieces, where the tool life of the power skiving cutter is limited to a small number of workpieces, is also possible. 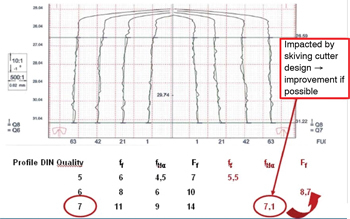 The achievable profile quality is depending on workpiece and tool set up in combination with the tool profile quality (Figure 10). Based on an AA class cutter profile angle qualities of DIN class 7 can be achieved. 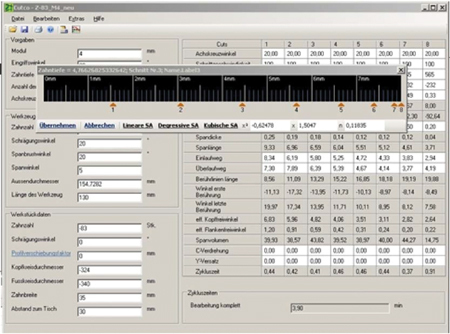 Further improvements of the tool quality will increase the workpiece related profile quality. The lead quality of the surface is from fine and non regular structure (Figure 11). 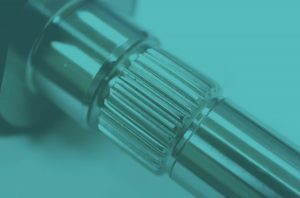 The diagonal structure of the feedmarks ensures reduced noise in the contact behavior of the gear set. 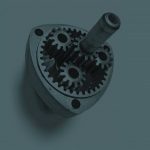 For internal and external gears, lead modifications are possible. This is an innovation regarding the possibility of flexible crowning on internal gears. 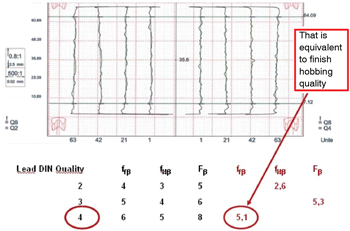 The pitch line quality is from DIN class 5 quality level (Figure 12). Future optimization of the direct driven workpiece spindles and tools will reduce the pitch line waviness. The singular pitch deviations are on the level of a shaping application. 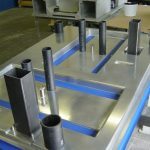 For finished manufacturing requests, an improvement by modified NC–filters and an increased inertia of the tool and work spindle are mandatory. 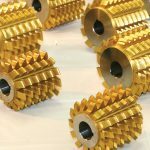 Main manufacturing technologies in soft gearing are hobbing, shaping, broaching, chamfering and deburring. 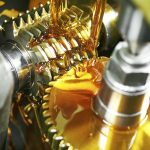 In serial and mass production of gears the directly linked use of singular processes is state-of-the-art. In parallel, the optimization of each process can be achieved by the integration of different processes. This shows a high potential for the reduction of the lead time as well as an increased level of work piece quality. The development of high performance numerical controls offers the gearing of internal and external gears by power skiving. Power skiving will become a preferred manufacturing technology for small and medium size batch production. 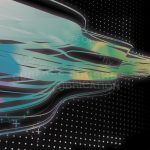 Based on the chip thickness and the friction on the chip building mechanism of the power skiving process, a wet cutting strategy is the preferred cutting process. 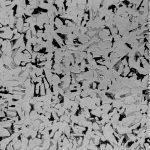 Further developments in tool substrate materials and modified coating technologies will drive the capability for dry manufacturing processes. 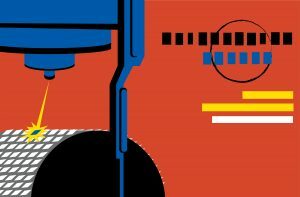 Compared to hobbing, the power skiving process will initiate higher tool costs. 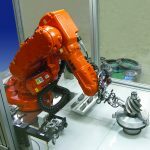 Compared to the shaping process, reduced manufacturing times and increased surface structure qualities will substitute shaping applications up to a module range of 8 mm. 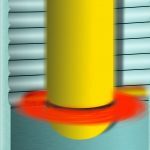 The energy consumption of the power skiving process is less efficient than the hobbing process due to an increased number of chips on the same level of friction per cut. Today, the dry machining and the temperature change of the workpieces during the machining can become a significant quality impacting factor.